We were in need of a runner for a short hallway to the laundry room. An area quest would never see and thought we would not spend the money to purchase an expensive rug. This rug looks OK, but I'm comparing it to name brand expensive rugs we have in the other parts of our home. We'll see how this runner holds up to human and 3 dogs over time. This medallion pattern is detailed in sensational colors of red, navy blue and ivory. Distinctly traditional design that will add a touch of class to any room. Made of comfortable polypropylene fibers that are easy-care. Vacuum and spot clean. 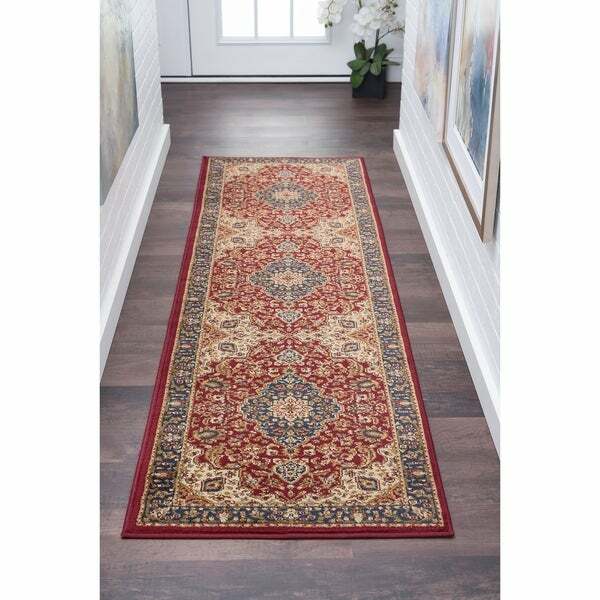 Exact Rug Size: 2'3'' x 7'3'' / 87 in. x 27 in. Dimensions 87.0 In. X 27.0 In. X 0.39 In. "The title of this rug shows the size as 2'7"x7'3" but product details shows it as 2'3"x7'3". Which is correct?" Hello nicolemcd11, this rug is 2 foot and 3 inches x 7 foot and 3 inches. Sorry for the confusion. Thank you for shopping with us!